Though the Goldfield Hotel does not exist today, it still experiences ghostly hauntings. It has been closed off and abandoned. The 154-room Goldfield Hotel was built on top of an abandoned gold mine opening for the first time in 1908, closing its doors in 1945. 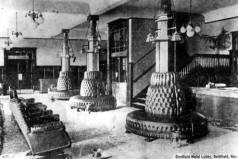 Many attempts to reopen the hotel have been met with problems due to unexplained incidents, thus hotel restoration has never been completed. The almost ghost town of Goldfield is hoping that one day the hotel can be refurbished so that a reopening could revitalize the town with new jobs and tourism. However, they’ve been promised and let down so many times, they’re not holding their breath. The hauntings are said to have originated with the sad story of a prostitute named Elizabeth. According to the legend, Elizabeth was a prostitute that hotel manager, George Wingfield enjoyed during the 1930s. She became pregnant and told Wingfield the child was his. For awhile he paid her to stay away. However, when she could no longer hide the pregnancy, Wingfield was said to have chained her to a radiator in Room 109. He kept her alive until she gave birth. Afterwards, Elizabeth was left to die in the room and the baby was thrown down the old mine shaft at the northern end of the basement. Soon, rumors ran rampant that Elizabeth’s ghost continued to visit Wingfield and the sound of a crying child could sometimes be heard coming from the depths of the hotel. Whenever Elizabeth’s ghost was seen, she was described as having long flowing hair, wearing a white gown, and looking sad as she paced the hallways, calling out to her baby. Others have reported her being sighted in Room 109, which is often described as being intensely cold, and on one occasion a ghostly figure appeared in a photograph of the room. However, most people report that while their cameras function normally everywhere else in the hotel, they refuse to work in room 109. There have been reports of other ghosts as well. On the first floor, the George Wingfield Room is said to be haunted by his ghost. Both cigar smoke and fresh ashes have been found there when no one had been in the room at all! George's presence has also been detected near the Lobby Staircase (left), where the ghosts of a midget and two small children have also been seen. The Gold Room is haunted by a ghost that "stabs" people. High psychic energy is been detected in the Theodore Roosevelt Room and a southwest room on the third floor. Some psychics say that the Goldfield Hotel is one of only seven portals to the Other Side that exist in the modern world. Many psychics who have visited the old hotel claim that it is a gateway into another world. 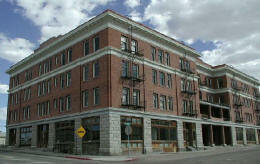 In the fall of 2001 The Goldfield Hotel was featured on Fox Family TV’s World’s Scariest Places.